I didn't realize breakfast was included... we had a fabulous private cooked breakfast for us served on our lanai. Incredibly fresh! Infinity pool is a nice size and practically private with only 3 villas around it. Beautiful secluded area, quiet and tranquil. Morning doves and roosters wake you in the morning. Wonderful owners and staff! very easy to communicate and attentive to any concerns!! They even contacted our tours for us to give directions for drivers. Internet worked great! Lebah Villas was exceptional. Even better than the pictures! Staff was attentive and non invasive. They helped arrange anything we needed along with a dinner made at the villa for a surprise birthday party. Breakfast was delicious of fruit, eggs and Bali pancakes and juice. Rooms and villa were immaculately clean. Beds comfy. Perfect central location to walk to nearby sites and restaurants and shops. We will definitely be back. Recommend this place for sure!! Beautiful villa. Great host and staff. Great location close to ubud and yet very quiet. Super friendly and always available staff. Felt like home. Very clean and nicely decorated house. Pool was amazing as well. In a quite area surrounded by rice terraces but still close to the main road. We had a whole villa to ourselves. The pool looks over the lovely lush valley. Only a short walk into Ubud centre. Our hosts were very helpful and accommodating. From the time we entered the property, we loved everything. The property looked exactly like it was shown in the pictures.The host and rest of the staff were really good and took good care of us. Lock in a great price for Lebah Villas – rated 9.6 by recent guests! Lebah Villas This rating is a reflection of how the property compares to the industry standard when it comes to price, facilities and services available. It's based on a self-evaluation by the property. Use this rating to help choose your stay! Offering a year-round outdoor pool with a bar, Lebah Villa is located in the secluded area in Ubud City-Center. Ubud Market is 2,300 feet from the property. The property features a clear view of Campuhan Ridge and rice fields. Free WiFi is available in all areas. Featuring modern architecture with antique Indonesian structure and furnishings, the villas have fully-equipped kitchens and a smart TV with Netflix streaming service. There is a massage table available by request. Each villa features a terrace and/or balcony for guests to relax in. Every unit has a private bathroom with free toiletries. The property is a 5-minute walk from restaurants, shops, and yoga studios in Ubud. Ubud Palace is 2,300 feet from Lebah Villa. Ngurah Rai International Airport is 18 mi away. When would you like to stay at Lebah Villas? This villa has a balcony, soundproofing and stove top. This villa features a balcony, toaster and washing machine. Luxury villa full kitchen large balcony two bedrooms and two bathrooms. High end newly built Villas with exquisite sunset view of rice fields and the Campuhan Ridge. Walking distance to Ubud shopping and restaurants. Quiet, professional staff, excellent amenities. Hi I am Made Born in Ubud married with 3 beautiful daughters 2 graduates from University and one still in School. Ubud is the heart of the cultural center in Bali. Day tours cooking classes yoga crafts and great restaurants near by. The villa is a 5 minute walk from the main road where restaurants and shops are located. Our location avoids taxi rides which are often stuck in traffic during high season. 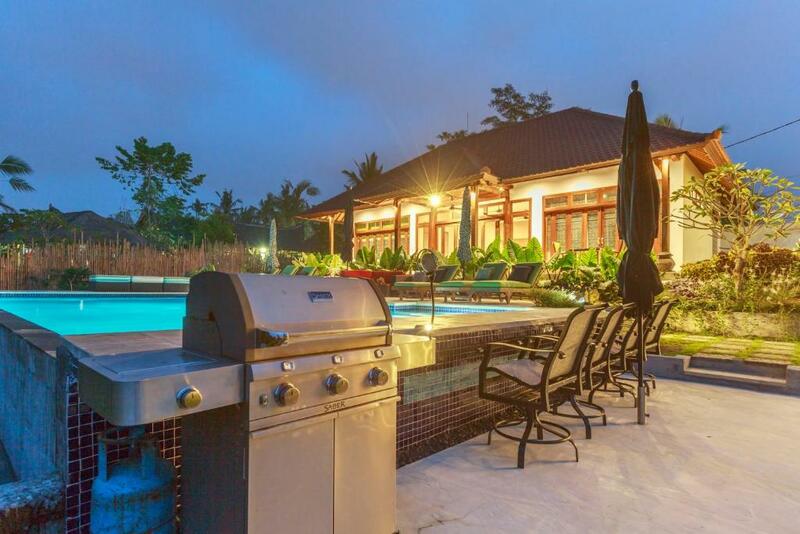 Villa is in a quite village surrounded by rice fields and a view of the Campuhan ridge. Exquisite Sunrise and sunset views from the villas. House Rules Lebah Villas takes special requests – add in the next step! Lebah Villas accepts these cards and reserves the right to temporarily hold an amount prior to arrival. Please inform Lebah Villas of your expected arrival time in advance. You can use the Special Requests box when booking, or contact the property directly using the contact details in your confirmation. Just be cognisant that there is a small second villa next door. We had a family with kids and they were very noisy at the pool. The trip was too short. Looking forward to go back. We stayed in the 2 bedroom villa. Air conditioning was only in the bedrooms. Master bathroom could use a touch more privacy. Do note there is a narrow-ish 5min walk to and from the Villa area. Constantly utilized by motor scooters from other villas along the path, a little dangerous. We did encounter a "rolling brown-out" overnight for 1 night, no aircon. The downstairs bathroom is small, and a towel is needed outside the door to stop flooding into the hallway. We liked everything. Just one suggestion for the host is to put specific pictures for each of the Villas so that host knows beforehand as to what they have booked and what to expect, since both the villas are pretty different from each other. The best reasons to like this place was, for a start the tasty breakfast. Also the villa had a wonderful view from the pool and was set in a perfect area. The villa was big and had perfect interior. The beds were comfy and it was very clean. Manager Putra wad so sweet that we had a wonderful time. Breakfast was very delicious. When we checked out, he gave us passion fruits as a present. The view was amazing while we are in the swimming pool. Everything in the villa was amazing! We were on the two bedroom villa, be aware that there is no lounge, just an outdoor eating area and an upstairs patio with comfy seats. Loved the amazing pool, incredible ceiling carvings, friendly hosts (Made was brilliant), the highly central location while still out in the rice fields, and the fact that there's a washing machine: it's the little things!